Finnriver’s Fire Barrel comes in a cute little stout, round, brown bottle — barrel-like, one might even call it. I’m sure it’s a complete coincidence. 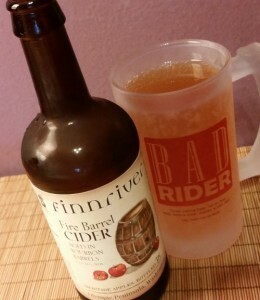 Fire Barrel is made from bittersweet apples and aged in Kentucky bourbon barrels, which add a deep amber-orange hue to the cider’s color and a woody aspect to the aroma, with hints of the high-proof fire of the bourbon in the background. In flavor, it’s an interesting mix of mellow and brash. On the one hand the bourbon shows up right from the start with oak notes and a sense of whisky aromatics filling your mouth; on the other hand, the initial aggressiveness soon eases off into something milder, burnt sugar and vanilla accompanying the sweetness of the cider apples. At 6.5% ABV, this is a lot less dangerous than some other barrel-aged ciders such as Alpenfire’s Smoke or Sea Cider’s Prohibition, and it inherits a more unique personality from the barrel-aging than my beloved (but much milder) standby, Schilling Oak-Aged. I think Fire Barrel would go great with a steak dinner — in fact, I’m looking sadly at my now-empty bottle and thinking about how well it would go with the “whiskey steak” recipe that’s one of my personal specialties. Finnriver doesn’t have a locator function, but they do have an online store (including the perpetually tempting cider club). Check out their offerings! I’m eager to get my hands on some of that Cacao Wine with Apple Brandy sometime. This entry was posted in Cider and tagged 500mL, barrel-aged, finnriver cider, fire barrel. Bookmark the permalink.